Ferdinand Cheval was a French postman who spent thirty-three years of his life building Le Palais idéal (the “Ideal Palace”) in Hauterives. The Palace is regarded as an extraordinary example of naive art architecture. Cheval began the building in April 1879. He claimed that he had tripped on a stone and was inspired by its shape. He returned to the same spot the next day and started collecting stones. 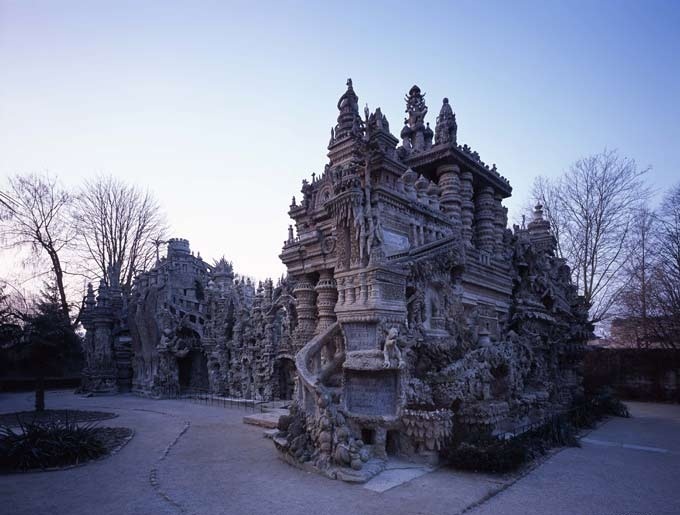 For the next 33 years, during his daily mail route, Cheval carried stones from his delivery rounds and at home used them to build his Palais idéal, the Ideal Palace. First he carried the stones in his pockets, then a basket and eventually a wheelbarrow. He often worked at night, by the light of an oil lamp. Cheval spent the first two decades building the outer walls. The Palace is a mix of different styles with inspirations from the Bible to Hindu mythology. Cheval bound the stones together with lime, mortar and cement. Cheval also wanted to be buried in his palace. However, since that is illegal in France, he proceeded to spend eight more years building a mausoleum for himself in the cemetery of Hauterives. Cheval died on August 19, 1924, around a year after he had finished building it, and is buried there.